Beautiful. Very elegant touch to my dining room decor. The Bacall high back chair absolutely commands attention in arctic grey cotton blend fabric and cherry mahogany finished legs. With a reaching, slightly tapered backrest and sloping arms, the dramatic Bacall is all about smart sophistication. Dimensions 47 in. H. x 24 in. W. x 28.3 in D.
Nice chair. Got it for my formal dining room as head chairs to use very sparingly. The color is a blue based medium to medium-light shade of gray. The second pictures show the color accurately. The seat width is narrower but I had a 300+ lbs male sit in it and he found it comfortable. The back is fairly straight up without any curves, which will force you to have good posture. The fabric is decent cotton, but not for everyday or child use. Must be sure not to snag or wear new denim and transfer the color onto the chair as I don't think it will hold up to steam cleaning- spot clean only. Overall, it should last me several years. Although this chair has the big, beautiful look I was looking for, it is meant for an extremely small framed person. In addition it is NOT a comfortable chair, very little padding and a very small seat. This would fit a average height woman with a very small frame at best. 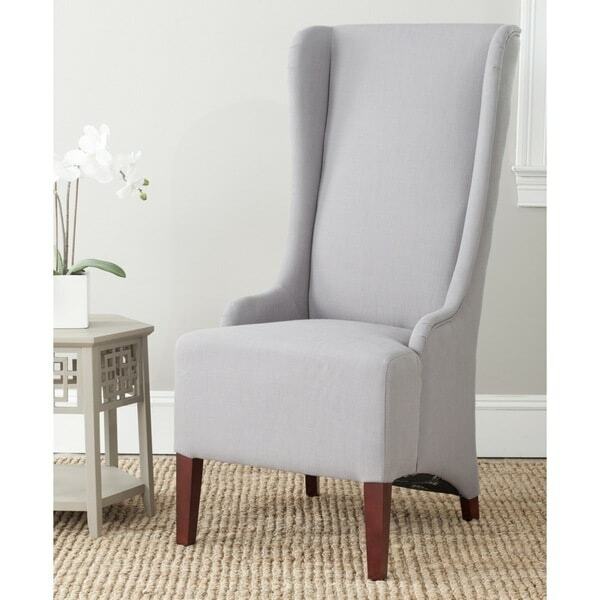 Also the color shown in the photo looks like more of a light grey and this chair is a medium grey. If you are looking for a big bold look and do not plan on sitting in these for a long time then these could be your chair. 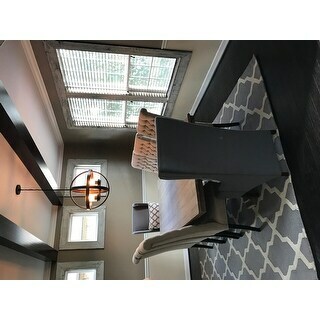 Please note that their are two measurements listed, the overall measurements and then the seat measurement, there is a quite a bit of difference between the two, (not much for seating room). We bought these chairs to redo our dining room. They add a very nice touch. I wanted something to make a statement &amp; so glad I bought these. Love theses chairs,they look great at the ends of my diningroom table! Because they are unusual and the seats are larger than the normal chairs of this style.